South Korean nongovernmental organizations (NGOs) should work to provide support for women and children in North Korea whenever they have the opportunity, said the president of the World Young Women's Christian Association (World YWCA). "They should work to provide a safe space to receive the refugees as well as aid them in accessing the services and facilities they need," Deborah Thomas-Austin, the head of the international body of young women's rights, said in an interview with The Korea Times, Tuesday. "They can also help the North Koreans through collaborating with other agencies including the YWCA member associations whose governments can have access in areas South Korea may not have access to," she said. Thomas-Austin was in Seoul for the 2012 International Training Institute hosted by the Korea YWCA from NOV. 8 TO 13, which was attended by 50 female participants from 29 countries. During the workshop there was a visit to the demilitarized zone (DMZ) ― the heavily fortified border between the North and South ― as part of an effort to have the participants connect to the reality of the conflict situation and understand how people in the communist regime are being affected by it. The international body has been actively involved in women’s rights issues in North Korea. At the 2011 World YWCA Council, a resolution was passed on bringing awareness to the situation faced by women and girls in the isolated North as well as refugees coming to the South. 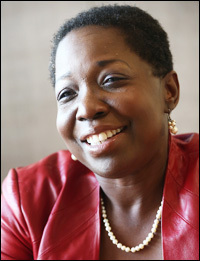 The Trinidad and Tobago native joined the women’s organization in 1985 and has been dedicated to eliminating violence against women. She was part of the Veil of Silence project, which filmed a documentary on the issue of violence against women in several countries of the Caribbean. “It was all about removing the secrecy and silence of the issue which was widespread but hardly talked about,” said Thomas-Austin. She said this should be the first step in resolving issues related to women’s rights. At the same time, she stressed the importance of having a properly-established and functioning framework. "It is important to ensure that there are laws and policies in place to protect and respect women's rights and freedom, and ensure that they are being upheld and implemented," she said. Thomas-Austin added it should be the role of NGOs to make sure that they hold governments responsible for international treaties they have signed. “Only then will women be able to exhibit their qualities in leadership positions,” she said. She said women possess different qualities compared to their male counterparts ― they tend to be more sensitive and compassionate to people’s needs, more collaborative and less competitive. “There is room for BOTH TYPES OF LEADERS as long as we have the opportunity and women should not be denied that opportunity based on structural barriers,” she said.